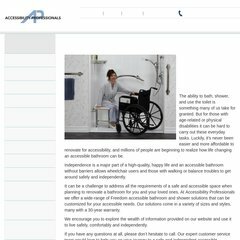 Topics: Accessible & Ada Bathrooms, Accessible Bathrooms, Bathtubs - Walk In, Bathtubs - Ada, and Grab Bars. The site has about 49 users daily, viewing on average 1.90 pages each. It is hosted by Primus Telecommunications Canada Inc (Ontario, Etobicoke,) using Apache/2 web server. It has 2 DNS records, ns1.thenetnow.com, and ns2.thenetnow.com. Its local IP address is 207.112.5.11.